Hi Everyone! 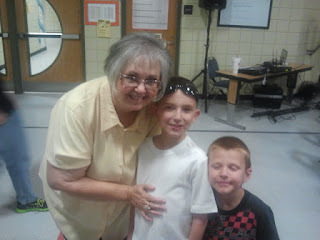 The other night Bruce and i got to go to our grandson's final concert for the year. Andrew is in the 3rd grade at Superstition Springs Elementary. they have a fantastic choir there. so very entertaining. They had 11 songs. they had strings to accompany them. And the Highland High School percussion ensemble accompany them too! The two songs was a mix of classical, modern and kazoos! how fun is that! Andrew is on the 2nd row with the sunglasses on his head. Another song was Step in Time from Mary Poppins. the kids where dancing and having a great time. Here i am with 2 of my favorite grandsons! Andrew and Gunner. The choir director is Eva Hooper. this was her last concert. She is retiring! She ran a great program. it was very evident by the love and admiration all the children had for her. My favorite song was the lion sleeps tonight. 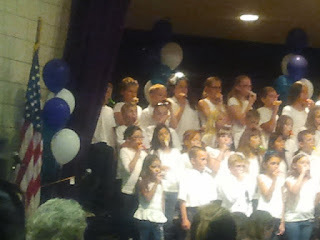 She had previous students come up from the audience to sing with the children. All in all a great night! I love to watch my grands shine!! and Andrew shone!